In the framework of the 53rd Munich Security Conference, President of Ukraine Petro Poroshenko had a meeting with President of Poland Andrzej Duda. The Ukrainian President informed on the escalation in Donbas and the ongoing Russian aggression against Ukraine. 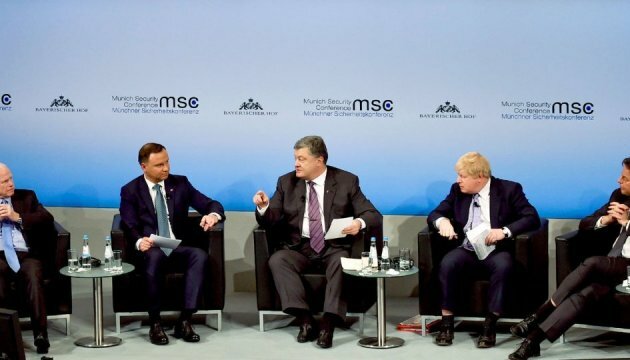 Petro Poroshenko emphasized the importance of compliance with the regime of the EU sanctions against Russia until full implementation of the Minsk agreements and restoration of Ukraine’s territorial integrity. The parties discussed the issue of reconciliation between the Ukrainian and Polish nations strongly condemning recent acts of vandalism in Huta Pieniacka and the National Historic Memorial “Bykivnia graves” probably organized by a third party. The parties discussed the involvement of Ukraine in regional initiatives, particularly cooperation between the Adriatic, Baltic and Black Sea countries. The parties also agreed to conduct a session of the Consultative Committee of the Presidents of Ukraine and Poland shortly.